Naledi’s gearing up to go! 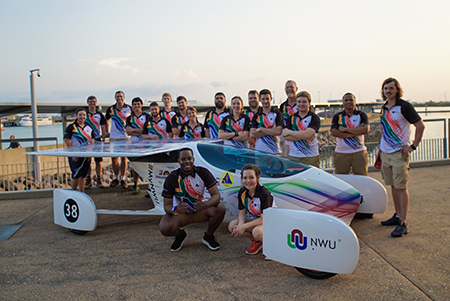 The North-West University’s (NWU’s) solar car, Naledi, is ready to take on the world. With the whole team assembled in Darwin, Australia and with the static scrutineering tests conducted on Wednesday, the team will now undergo dynamic scrutineering tests on Saturday before the first leg kicks off on Sunday. It is the start of a 3 000 km adventure across the Outback, all the way to Adelaide. Changes include moving some of the hazard lights on their chase and lead vehicles and a small change to one of the circuits in the battery box. “I’m very excited; we only need to do about half a day’s work to get the car through static scrutineering and then we start with dynamic scrutineering,” says Prof Helberg. Dynamic scrutineering entails figure-eight’s, slalom courses, emergency stops, as well as a fast lap around the racecourse at Eden Valley in Darwin. Naledi will travel between 500 and 600 km during the first leg of the race. • The NWU manufactured a special cooling method for the solar array using 3D-printing technology and computational fluid dynamics in the design process. • The suspension system for the car had to fit into a very narrow strut and had to have very little play. It was designed by the Faculty of Engineering’s fourth-year students. • The car has a fitted speed-cruise system which is based on energy usage and not specifically speed, although it can be adjusted to suit that need as well. • The aerodynamic design of the car was based on the Jonker Sailplane, which gives it a very low drag resistance. • The team targets a constant speed of 80 km/h by generating 8 kw/h throughout the day. • The car has a battery pack that consists of 403 Li-ion cells which weighs just under 20 kg. • In total, the car weighs 225 kg. • The car is just short of 5 m in length with a width of 2,2 m.
• It has a 4 m2 solar array. Naledi and the team in Darwin.